According to a 2015 study published in Applied Animal Behavior Science, Norwegian researchers found that dogs are more afraid of fireworks than they are of gunshots, thunderstorms, or heavy traffic. The study took into account 5,000 dogs (in 17 breeds) and asked their owners to rank their reaction to four noise stimuli: fireworks, gunshots, traffic, and thunderstorms, and of the 5,000 dogs, 21 percent of dogs showed “strong or very strong signs of being fearful” during fireworks. This was far greater than the 10 percent of dogs afraid of thunderstorms and the 14 percent of dogs afraid of gunshots. The study also found that fear of loud noises increases with age. What does this mean for your sweet pup? It means that when everyone is ooh-ing and ahhh-ing at the fireworks display outside, your dog is freaking out. And it isn’t just your dog who is scared. It is your cats, too. A 2010 study in New Zealandfound that of the 3,527 animals, both dogs and cats, surveyed, 1,635 (roughly 46 percent) displayed a level of fear of fireworks “recognizable to their owners.” In the study, dogs exhibited a higher fear response than cats, but the duration of their fear-based responses did not differ. The study also found that fireworks caused dogs to exhibit active fear behaviors (like barking) while cats were more likely to exhibit hiding and cowering behaviors. Of the animals surveyed, six percent of them were injured because of their fear-based reactions. It is no wonder that New Year’s Eve (and, if we are being honest, most nights surrounding New Year’s Eve when the neighbors shoot off bottle rockets) can be so stressful to our pets! There are a few ways that you can keep your pet calm and reduce their stress this holiday season as the fireworks blast off. Your natural instinct might be to let your dog face their fear and join you outside. However, if they are outside and off-leash, their fight or flight response may be triggered. They may try to run away become more aggressive. Let your dogs do their running and exercising outside earlier in the day, but when the fireworks begin, bring them in. Keep their environment calm with blinds or curtains closed so that they aren’t panicked by the bright lights in addition to the noise. You may want to play soft music to ease their fears and be sure to go inside and give them lots of belly-rubs and love throughout the night. Remember, if there are lots of new people in your home for a party, or if you are using confetti poppers or loud noise makers, you should keep your pet in their own designated space where your guests will not disturb and excite them. CBD Dog Health makes all-natural products that can be useful tools in combatting fireworks anxiety. 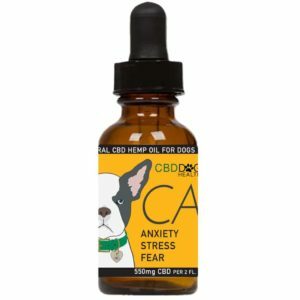 CALM for dogsand CALM for catswill help reduce your pet’s anxiety by feeding their endocannabinoid system and restoring their body to a feeling of peace. CBD works to restore the balance in the body, making it easier for your pet to rest during loud events like fireworks, thunderstorms, and as your neighbors may fire guns into the air (which we do NOT recommend). Although many vets recommend giving your pet children’s Benadryl, it is important to remember that this drug is not intended for animals and may have side effects. For example, Benadryl can put a strain on a dog’s liver and kidneys if they are already experiencing issues in those areas. 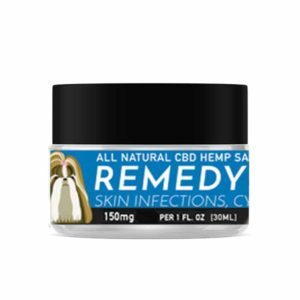 CBD is a safer, natural solution to keeping your pet relaxed. Your pet can benefit from being put in a shirt, vest, or wrap. Putting something with weight or slight pressure on your pet creates a calming effect, according to a recent study examined in the Wall Street Journal. Just like weighted blankets help people with anxiety, creating a comfortable weighted shirt or swaddle can give the dog a sense of feeling grounded and calm, so long as they are still able to move around freely. You can find vests, like the Thunder Shirt, at your local pet store. You can also save money by wrapping your pets chest in an ace bandage (but not too tight!) to create the same effect. Remember, your pet does not understand that the fireworks are a good thing. What they do understand is that there are loud noises and bright lights, and often a lot of tension and anxiety from small children and anxious pet parents. Try to keep yourself as calm as possible and remember that getting frustrated with your dog barking or shaking will not help, and both you and your dog can begin enjoying holidays together. For more information on CBD Dog Health and using CBD for your pets this holiday season, visit www.cbddoghealth.com.